My research seeks to uncover the ecological and evolutionary processes that have led to the diversity of organisms that we see in the tropical region today. To this purpose, I integrate genetic, environmental, and phenotypic data. I often study biodiversity in the context of climate and landscape gradients. I find comparative approaches to be powerful, so my projects target multiple populations and species. My work uses biological inventories in the field, high-throughput DNA sequencing, bioinformatics, phylogenetics, population genetics, geospatial analyses, ecological niche estimation, and multivariate statistical techniques. I have focused on amphibians and reptiles as study organisms. Learn more about my research projects below. How have tropical species responded to former environmental change? My research uses genome-wide data to infer the history of species and clades. Using population genomic and phylogenomic methods, I have studied how past climate and landscape changes have affected the distribution and demography of tropical taxa. 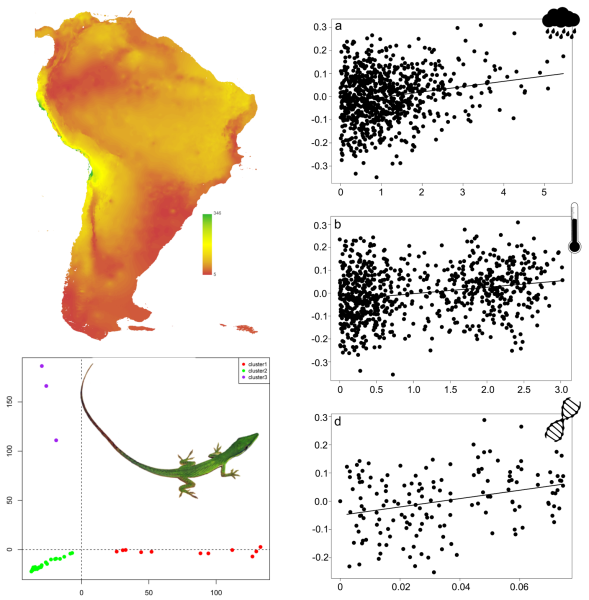 This work has investigated population size shifts, range expansions, gene flow, and the timing of population coalescence in rainforest lizards (Anolis and Polychrus). I have found that past climatic fluctuations fostered rainforest expansions and species exchange between Amazonia, the Atlantic Forest, and the Andes ( Prates et al. 2016 Mol. Ecol. ; Prates et al. 2017 Mol. Phyl. Evol. ). However, species that differ in body size and use of forest edges showed contrasting signatures of population expansion or contraction through time ( Prates et al. 2016 PNAS ). These results support that faunal interchange among major biomes was essential to the assembly of tropical biotas, challenging a simple model of in situ diversification. Moreover, this work suggests that ecology and phenotypes attenuate or exacerbate the impact of habitat fragmentation on co-distributed organisms. How do environmental gradients shape genomic variation within and among species? My research combines genomic and environmental data to understand how species adapt to local habitats and colonize novel environments. 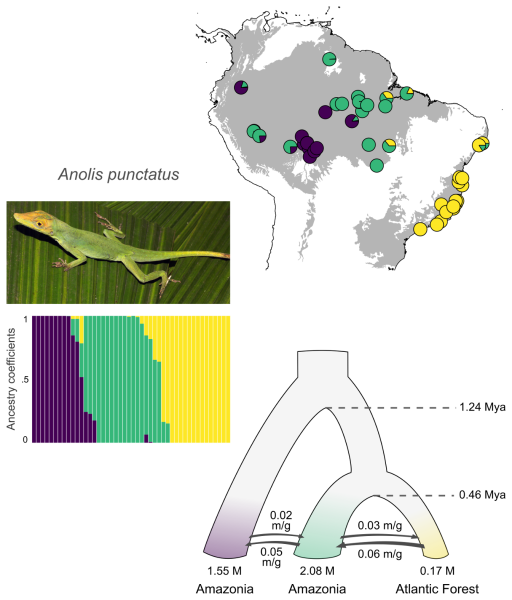 I have sampled entire anole lizard (Anolis) assemblages throughout South America to investigate the ecological correlates of genome-wide allele frequency patterns and test whether populations from different habitats harbor genomic signatures of divergent selection. This work has found strong associations between temperature and precipitation gradients and genes that act on energy metabolism, immunity, and development ( Prates et al. 2018 Ecol. Evol. ). These results support a scenario of local adaptation and provide insights into the physiological processes that have undergone selection during the colonization of novel habitats. What are the drivers of phenotypic diversity within species? Some species show remarkable levels of phenotypic variation among populations. I am interested in the historical and ecological factors underlying this pattern. My research combines multivariate statistical models and environmental, trait, and genetic data in a geospatial framework. Building upon my Master's work ( Prates et al. 2012 J. Morphol. 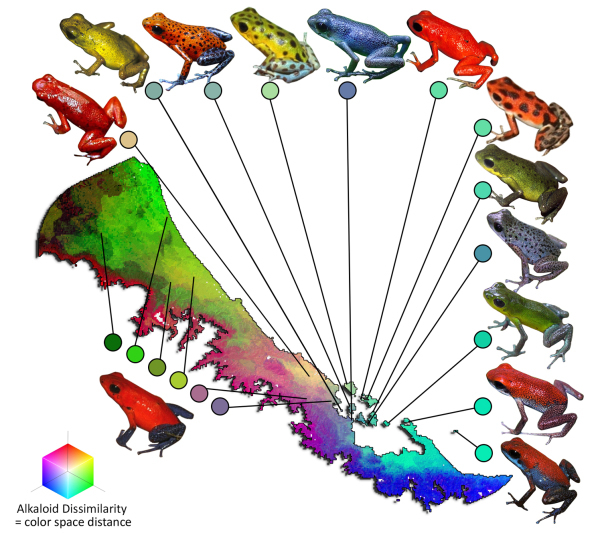 ), I have focused on the drivers of toxin composition variation within species of poison frogs (Dendrobatidae). Some species show 200+ distinct alkaloids, obtained from arthropod prey. This work has recovered links between frog alkaloid composition turnover, population genetic structure, prey turnover, and climate and soil gradients. Many species that occur in tropical regions remain unknown to science. Others have unclear phylogenetic affinities and geographic distributions. Through extensive fieldwork, I have sampled several poorly known taxa. I use genetic and phenotypic data to assess their phylogenetic relationships and taxonomic status and to outline species ranges. 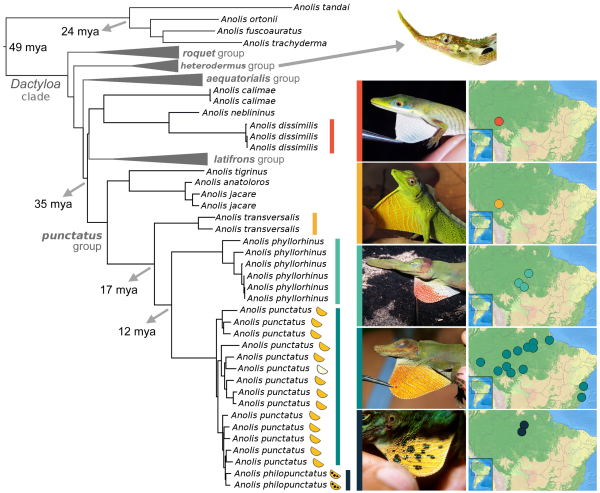 This work has provided insights into the morphological evolution and historical biogeography of neotropical amphibians and reptiles (e.g., Prates et al. 2015 Mol. Phyl. Evol. ), led to the discovery of species presumed extinct or new to science (e.g., Prates et al. 2017 Mol. Phyl. Evol. ), and documented invasive taxa (e.g., Prates et al. 2016 S. Am. J. Herpetol. ). Ongoing work has focused on lizards and frogs from western Amazonia and tepui mountains in northern South America.